Earlier I traced the history of vampire metaphor from “The Vampyre” by John Polidori–which more or less created the trope of an undead nightmare stranger–to the later visions of the vampires as an incarnation of sin. This last covered a spectrum of sin as temptation (especially in the Hammer films) to a search for redemption (the likes of Barnabas Collins and Nick Knight). But lately, vampirism in books, television and film began exploring a new idea. Like all such evolutions, the one evolved (one might say ‘bled’) into another, but by now the trend has become fully visible. Vampires are not strangers. They are not avatars of evil. Much has been made of how the cable series “True Blood” in effect portrays the undead as just another minority. With respect, this misses the point. Consider, for example, how some minorities have been portrayed elsewhere. Until very recently gays and lesbians were at best sympathetic but doomed mistakes in the world, destined for some kind of tragic end. Look in vain for a portrayal of a heroic or merely ordinary Japanese American in any film for the decade or so following December 7, 1941. Likewise look for portrayals of deeply religious Arab Muslims following 9/11. Rather “True Blood’ takes the stance that vampires are not simply a minority, but a minority not fundamentally different from us in any moral sense. They too can be stupid, savage, wise, funny, sophisticated, saintly, victimized, petty, kind–the whole range of our own emotional palate. On a lighter note, “The Vampire Diaries” focuses on vampires as the harbingers of maturity, for good and ill. The characters on the show (dubbed initially by some as “Vampire Creek” or “Twilight 90210”) begin to confront an adult world of responsibility and difficult choices, of conflicting values without easy answers. More–and this is a point often missed–the vampires themselves are increasingly forced to give up their eternal immaturity as they interact with mortals. Damon confronts all kinds of uncomfortable, even painful truths about his past and present. The girl he loved more than life turned out to have never loved him. A girl he grows to care for, prefers his kinder and gentler brother. Consequences of all his actions begin to haunt him. Changing the details, this describes the arc of virtually every major character in the series–again showing Vampires Are Us. And we are vampires. Such becomes one of the defining themes in both of the most popular book series about the undead for the last three decades. 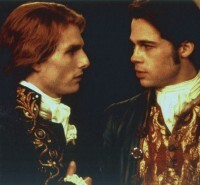 Anne Rice’s dark angels like Louis and Lestat don’t really seem alien so much as heightened versions of ourselves. The more we learn about them, the more obvious this proves. By the time “Queen of the Damned” came out, we’d learned to understand that Rice’s vampires were literally just super-charged versions of the mortals each had once been. Each confronted the same existential questions normal humanity faces, coming up with as many answers. Stephanie Myers’ “Twilight” books attract the criticism of being nothing but fluff and eye candy–but the author, a devout Christian, made great efforts to make us see her vampires as essentially human where it counted. Capable of love, of guilt, of redemption as well as all of the flaws to which mortal flesh–or at least mortal psyches–are heir to. We the audience are constantly encouraged to want to kick Edward for his drama-queen bemoaning about being a monster without a soul. Likewise one of the most vivid examples of this new trend is in the bestselling novel “Let The Right One In” by John Ajvide Lindqvist, filmed once in its original Swedish and again in English under the title “Let Me In.” Perhaps no vampire tale has more brutally portrayed the humanity of the vampire along with the lack of humanity in (at least some) humans. Yet despite this, and despite the genuinely violent nature of the vampire we come to know (and love), we don’t feel either Eli or Abby are “other.” Rather, through the eyes of first Oscar and then Owen, we see someone as lonely as ourselves. Someone as lost, someone as vulnerable, someone as mystified by this world as we feel every day. In the cold night, we meed one of the undead–and find ourselves at long last something other than alone. The vampire really is us. Why is it so astonishing that vampires are so similar to humans? They are self-aware, sentient beings. Surely anyone who believed them incapable of diverseness as a species is suspiciously naive. I was always fond of vampires, they have this sensitive yet dangerous nature about them. Although I don’t think drinking human blood is such a great idea, I think that vampirism directly contributes to empathism. As vampires are sensitive to light and certain negative energies, empaths have their own energy related sensitivities.